Barcelona, one of Europe’s most incredible cities with captivating architecture, a warm sunny climate, a hot nightlife, history, art, the beach, the mountains…, the choices are almost too much. For travelers hoping to get the best out of a cram-it-all-in weekend, aided only by an (often misleading) guidebook, the greatest opportunities can often be lost in a haze of tourist queues, metro maps and phrasebook-flicking. Many travelers, while searching for adventure and the unknown, might find themselves longing for a friend that knows their way around the city. “That’s what I like to be, I like to treat travelers like friends or family coming to visit, and I am going out to show them around and have a good time with them,” says Gaston Magrinat, a professional guide who now specializes in creating personalized, bespoke tours of Barcelona. Gaston’s success has been in recognizing the wealth of attractions Barcelona has to offer, as well as the importance of the uniqueness of each traveler. "Most travelers don’t want to tread the hard-worn tourist trail. I get to know my clients, the kinds of things they enjoy doing and those that they definitely wouldn’t like – even if the guidebook claims it’s awesome, and then plan their trip accordingly. After all, we all do not share the same interests." As thousands descend on Gaudi’s magical city every year, every traveler is looking for their own Barcelona Experience, the name Gaston so aptly chose for his service, which has gone on to ensure visitors of all ages and interests have loved every minute of their visit. For one group of drumming enthusiasts, their Barcelona Experience was a drum circle in an intimate studio setting facilitated by an instructor. This was followed by a painting workshop at Gaudi’s famous, must-see Park Guell. "The guys were into drumming and wanted to play while here, so I organized a drum workshop for them. They also wanted to try out their artistic skills while surrounded by incredible architecture, so armed with crayons, markers, charcoal and drawing pads we headed to Park Guell to record our impressions." A couple who were keen cyclists and had requested something challenging were taken on an off-the-track mountain ride, entering Park Guell from above, where they were treated to spectacular views. The setting presented the ideal opportunity for Gaston to indulge his passion for photography. 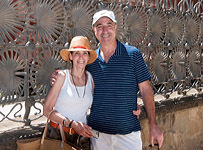 “If my clients agree, I take digital photos throughout their visit, providing them with a photo album to help them treasure their Barcelona Experience. With the unusual views serving as a backdrop, most people really enjoy the results." Whatever the visitor’s hopes for their trip, most want to be sure of good food and drinks, and a great atmosphere when they go out at night. Gaston, bilingual and a resident of Barcelona for five years, can help select the best places – whether it’s for seafood, traditional Catalan fare, Chinese or Italian. These adventures are relatively tame for a guide whose background is in working with troubled youths in a wilderness setting. Rustling proudly through Thank-You letters from clients, Gaston selects one from a couple in their sixties. It reads more like a letter to that fellow traveler you strike up a special friendship with, than a standard thank-you note to a hotel or travel agent for good service. It’s refreshing to feel that, even in a major European tourist spot, which has soared in post-Olympics popularity; it is still possible for the traveler to enjoy their own, stress-free, original, Barcelona Experience. Gaston showing a friend the wonders of Barcelona in the early days of Barcelona Experience.